The #1 New York Times bestselling author of A Man Called Ove and Beartown delivers an insightful and poignant holiday novella about a man who sacrificed his family in the single-minded pursuit of success and the courageous little girl fighting for her life who crosses his path. It all begins with a father telling a story to his son on Christmas Eve. But this isn’t your typical Christmas story. The father admits to his son that he’s taken a life but he won’t say whose—not yet. One week earlier, in a hospital late at night, the man met a five-year-old girl with cancer. She’s a smart kid—smart enough to know that she won’t beat cancer by drawing with crayons all day, but it seems to make the adults happy, so she keeps doing it. As the man tells his son about this plucky little girl, he slowly reveals more about himself: while he may be a successful businessman, idolized by the media and his peers, he knows he failed as a parent. Overwhelmed by the responsibility of fatherhood, he took the easy way out and left his wife and little boy twenty years ago to pursue professional success. Now he is left wondering if it’s too late to forge a relationship with his son, who seems to be his opposite in every way—prizing happiness over money, surrounded by loving friends in a cozy town where he feels right at home. 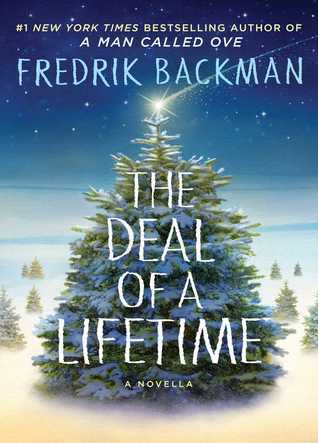 Written with Fredrik Backman’s signature humor, compassion, and “knack for weaving tales that are believable and fanciful” (St. Louis Post-Dispatch), The Deal of a Lifetime reminds us that life is a fleeting gift, and our only legacy is how we share that gift with those we love. The Deal of a Lifetime is a story about love, forgiveness, and sacrifices. I don't know how Backman always manages to get a tear out of me, but he does it every singe time. This novella is less than 100 pages and I still cried like a baby. Backman's writing is so personal and deep that he makes the reader feel everything the characters are feeling. This was a very short novella, so I don't want to dive into the plot (I would just be repeating the synopsis from above), but I will tell you this novella is a must read. Not only does it make you feel ALL OF THE FEELINGS, but the cover art and illustrations inside are also beautiful. Bachman is an auto buy author for me and The Deal of a Lifetime was no exception to that rule. I highly recommend this novel to readers of all genres. Plus, its a small hardback so it would make a great stocking stuffer! *Thank you Atria for sending a finished copy of this novel in exchange for an honest review.